Facts about Gray Reef Sharks, "Scientific name for Gray Reef Shark is Carcharhinus amblyrhynchos". Gray Reef Shark is known invariably as the Short Nose Blacktail, Bronze Whaler, the Gray Reef Shark is distinguishable from the other sharks because of its plain white tipped dorsal fin. On the other fins, some dark tips can also be seen. In length, the Gray Reef Shark breed of shark grows to about 5 feet to 6 feet 6inches (1.5 to 2 meters) and weighs between 45 and 70 pounds (20.41 to 31.75 kg kg). In terms of lifespan, the Gray Reef Shark has been known to live up to 25 years of age. It has a unique sense of smell. The Gray Reef shark has a moderately streamlined stout body with a long and blunt snout and round eyes. On the upper jaw of the Gray Reef Shark it has 14 teeth rows while on the lower jaw it has 13 rows. The shape of the upper teeth are triangular with slanted cusps. The bottom teeth on the other hand have relatively narrower and erect cusps. Between the first and the second dorsal fin of the Gray Reef Shark, there is no ridge that is separating them unlike in other breeds. The pectoral fins are falcate and narrow. 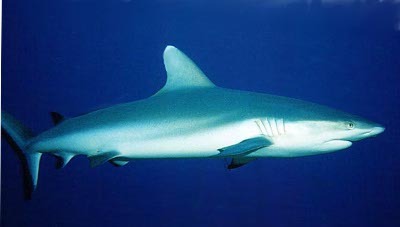 In terms of color, the Gray Reef Shark has a gray top with a bronze sheen and on the underside it has a white coloration. The Gray Reef shark feeds on octopus, squid, bony fish, lobsters and crabs as its main food source. It is great hunter in open waters due to its strong sense of smell. The Gray Reef Shark also have proven excellence in trapping shores of fish in coral reef. The Gray Reef Shark species is viviparous which means the eggs develop inside the belly of the female shark and they give birth to healthy and fully developed pups. Every litter contains 1 to 6 pups born after a gestation period of 9 to 14 months. There are over 400 types of sharks, Sharks have the most powerful jaws on on earth. Gray Reef Sharks jaws, both the upper and lower jaws move. Gray Reef Sharks skin is made of denticles instead of scales like other fish. The denticles are constructed like hard, sharp teeth (tooth-like projection) and this helps to protect the Gray Reef Shark from being injury. The Gray Reef Shark is carnivores meaning: an animal that feeds on flesh (Meat). "Scientific name for Shark Selachimorpha"